It was the last $1,500 No-Limit Hold'em tournament of the year at the 2014 World Series of Poker and that fact alone was enough to create an impressive turnout of 2,563 players. This was by far the biggest $1,500 NLHE tournament of the WSOP and it created a prize pool of $3,460,050. 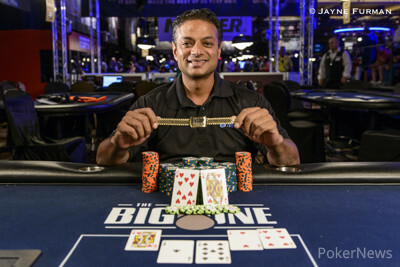 It concluded with an epic heads-up match that went nearly five hours in length, with Salman Jaddi emerging with the $614,248 first-place money and his first WSOP bracelet. The final hand would see Jaddi hit a runner-runner miracle when his bested Brandon Hall's . Hall had a huge lead after a flop of but Jaddi would hit a on the turn to give him a flush draw that would be completed on the river. "I didn't want to say 'one time' out loud, but that's what I was thinking," Jaddi said, sitting at the table, unable to believe what had just happened. "I feel like I played awesome heads-up. Get lucky along the way sometimes. That's how it goes." Jaddi explained some of his thought processes at the final table afterwards: "Four handed, I sensed that it would be Brandon and I going heads-up. I tried to play off of my image and steal some chips. Once we were heads-up, Brandon kept value betting thin and I was able to pick up some pots. Once I got the lead, I came back and played small ball with him." Jaddi went on to add "that if Brandon would have taken the chip lead today, I thought I'd be in trouble so I kept trying to apply pressure to make sure I kept the lead." On his way to victory, Jaddi would knock out the first five players at the final table eliminating Kurt Jewell (9th - $45,603), Steve Sung (8th - $59,547), Thomas Dietl (7th - $78,681), David Bravin (6th - $105,185), and Cherish Andrews (5th - $142,346). His heads-up counterpart, Hall, would take out the remaining two players, Guillauma Marechal (4th - $194,939) and Zach Gruneberg (3rd - $270,299) to get us to the beginning of what would be a marathon battle between the pair. Jaddi would start to pull away early in the match, getting to a more than 5-to-1 chip advantage at one point, but Hall would chip away and get things nearly back to even when the two decided to call it a night. The new day then saw Jaddi pull ahead, but Hall would double-up once to regain some momentum. Jaddi again took control, however, leading up to the final hand that would see him declared the winner. 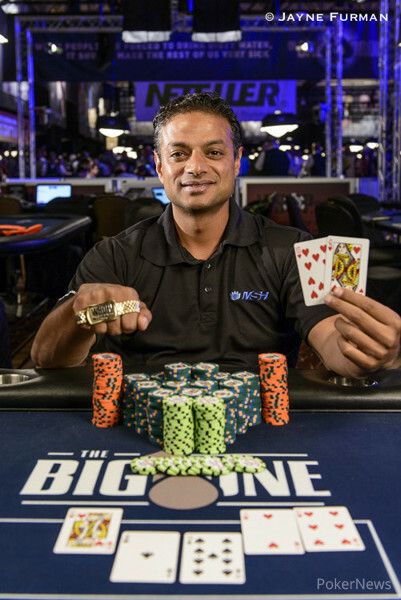 Among the 270 players that made the money were notables like Jared Hamby, Keven Stammen, Will Failla, Matt Stout, Byron Kaverman, John Racener, Ravi Raghavan, Lauren Kling, Shannon Shorr, Tony Dunst, Kyle Cartwright, Alex Bolotin, David Peters, Layne Flack, Joe Tehan, Scott Baumstein, and Dutch Boyd. Meanwhile notables who fell short of the cash included Phil Hellmuth, Ole Schemion, Ryan Hall, Mark Hoke, Amanda Baker, Nick Abou Risk, Sofia Lovgren, Victor Ramdin, Max Steinberg, Dominik Nitsche, Samuel Chartier, Yann Dion, and Marc-Andre Ladouceur. Jaddi's last words were ones that all amateurs could relate to: "I'm a business owner, not a pro. I play for fun. Anyone has a shot to win this thing. I didn't play many hands, but somehow I ended up here. If I can do it, anyone can." That concludes PokerNews coverage of Event #60: $1,500 No-Limit Hold'em. Thank you for following along and make sure to stay tuned as coverage of the Main Event will get underway on Saturday! Brandon Hall Eliminated in 2nd Place ($381,885); Salman Jaddi Wins! Hand #371: Brandon Hall open-shoved all in and it took only a moment for Salman jaddi to make the call, putting Hall at risk and the gold bracelet within his grasp. Both men stood as the dealer rapped the table and fanned out a flop of . Hall kept the lead, but Jaddi did have some outs. The fell on the turn giving Hall two pair, but Jaddi now had a flush draw as well. The dealer then double-tapped the felt one more time and delivered the on the river, giving Jaddi a flush and the victory. Hand #364: Brandon Hall got a walk. Hand #365: Salman Jaddi got a walk. Hand #366: Jaddi opened to 320,000, Hall three-bet all in, Jaddi asked for a count, and folded when he was told 2,165,000. Hand #367: Hall limped, Jaddi moved all in, and Hall gave it up quickly. Hand #368: Jaddi opened to 320,000 and tool down the pot. Hand #369: Jaddi was given a walk. Hand #370: Hall got a walk. Hand #359: Salman Jaddi received a walk. Hand #360: Jaddi opened to 320,000 and Brandon Hall called. The flop came and both players checked. The turn was the and Hall check-called a 350,000 bet from Jaddi. The river was the and Hall would check-fold to a 750,000 bet from Jaddi. Hand #361: Hall called from the small blind and Jaddi checked his option. The flop came , Jaddi checked, Hall bet 160,000, Jaddi check-raised to 320,000, and Hall made the call. The turn was the and Jaddi led out for 550,000. Hall went into the tank for several minutes. Towards the end, while doing a chip trick with his left hand and shuffling four chips in his right hand, Hall looked towards the clock as if to see when the blinds would go up. Jaddi sat motionless and Hall eventually relented. "Show one time," said Jaddi. Hall laughed and replied "You show." Jaddi said "You don't want to see," but showed, anyway — a bluff with . Hand #362: Hall received a walk. Hand #363: Jaddi received a walk. Win Your Way to the WSOP Main Event in the 25 Seat Scramble! The $10,000 World Series of Poker Main Event is only a few days away, but there's still plenty of time to win a seat to the grandest tournament of the year. On July 5, WSOP.com in Nevada is guaranteeing 25 seats to the Main Event in the 25 Seat Scramble, a $215 satellite that begins at 5 p.m. PST. Saturday, July 5 – 2 p.m. Anyone can play, and anyone can win. Register for the 25 Seat Scramble on Saturday and take your shot at poker immortality! Hand #354: Jaddi opened and Hall mucked. 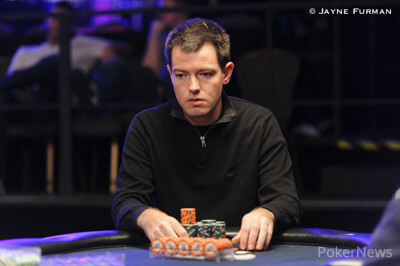 Hand #355: Hall limped, the dealer spread a flop, and Jaddi check-folded to a Hall bet. Hand #356: Jaddi opened, Hall announced all in, and Jaddi mucked flashing the . Hand #357: Hall raised and Jaddi made the call. The dealer fanned out a flop, and both checked to the on the turn. Jaddi led with a bet of 175,000 and Hall folded. Hand #358: Jaddi opened and Hall folded. Hand #349: Brandon Hall opened to 320,000 and Salman Jaddi made it 640,000 to go. Hall folded. Hand #350: Hall received a walk. Hand #351: Jaddi received a walk. Hand #352: Jaddi opened to 320,000 and Hall folded. Hand #353: Hall opened to 320,000 and Jaddi folded. Hand #344: Brandon Hall got a walk. Hand #346: Jaddi opened to 320,000 and Hall folded. Hand #347: Hall limped, and a flop of was delivered. Both checked to the on the turn, Jaddi led for 250,000 and Hall gave it up. Hand #348: Jaddi opens to 320,000 and stole Hall's big blind. Hand #341: Brandon Hall called from the small blind and Salman Jaddi checked his option. The flop came and Jaddi checked. Hall bet 160,000 then Jaddi check-raised to 325,000 and Hall folded. Hand #342: Jaddi raised to 320,000, Hall moved all in and Jaddi folded. Hand #343: The dealer exposed the and it became the burn card. Hall called from the small blind and Jaddi moved all in. Hall quickly called and told his rail "the other one was an ace, too" as he turned over . He was dominating Jaddi's and would continue to lead all the way on a run out of making a Broadway straight on the end to double up to 4.75 million in chips.